﻿ Spain - Walking the Camino Frances between Burgos and Leon. This 10 day walk includes hotels, meals, luggage transfer, one guide book, maps, English speaking email or phone assistance. 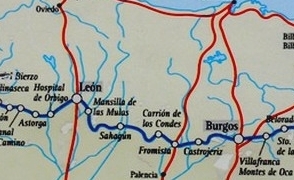 Some 778 km long starting from Saint Jean Pied de Port in France, the Camino Frances passes through Pamplona, Puente La Reina, Estella, Logrono, Burgos, Leon, Astorga, Ponferrada, and Sarria before it reaches the City of the Apostles in the Western reaches of Galicia. This section crosses Castile and Leon through the Meseta or tableland,sunburnt barren and arid landscape with quaint villages, and still preserves the most beautiful treasures of the medieval Spanish architecture. Burgos. The city is quite rich but take the tie to visit Santa Maria Cathedral. Hornillas del Camino - Castrojeriz. 20 km (12.4 miles) - 5h walk. 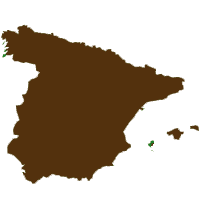 Castrojeriz - Fromista - 25 km (15.5 miles). 6h walk. Carrion de los Condes- Calzadilla de la Cueza- 16 km (10 miles)- 4h15 walk. Calzadilla de la Cueza - Sahagun - 15 km (9.50 miles) - 4h15 walk. El Burgo Ranero- Mansilla de la Mulas - 18,5 km (12 miles)- 5h walk. Mansilla de la Mulas - Leon - 17 km (10.5 miles) 4h45 walk. 910 € per person in single room. 2 star hotels and Guest Houses (depending upon availability). Private bathrooms. Half board from dinner day 1 to breakfast day 10 (except dinner in Burgos and Hornillos del Camino). The taxi between Moratinos and Carrion de los Condes. English Phone Assistance during your trip. The trip to the start of the trip and from its end. All lunches. The dinners in Burgos, Leon and Hornillos del Camino. Train station in Burgos- Airport. Train station in Leon- Airport.